"Japhy Ryder," says poet Allen Ginsberg, looming in the background of The Dharma Bums behind the somewhat symbolic mask of Alvah Goldbook, "is a great new hero of American culture." And the fact of the matter is that he is also the hero of The Dharma Bums not essentially because of his and Kerouac's devotion to Buddha but because he represents, perhaps as perfectly as anyone can, a unity of the hipsterism, the Paul Bunyan travelogue and all the other spontaneous and classic American forces that have helped create the Beat Generation. "I was amazed at the way he meditated with his eyes open," wrote Kerouac. "And I was mostly humanly amazed that this tremendous little guy who eagerly studied Oriental poetry and anthropology and ornithology and everything else in the books and was a tough little adventurer of trails and mountains should also suddenly whip out his pitiful beautiful wooden prayerbeads and solemnly pray there, like an oldfashioned saint of the deserts certainly, but so amazing to see it in America with its steel mills and airfields. 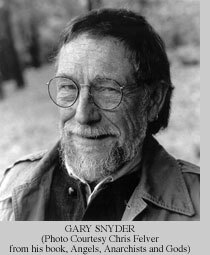 . ."
Undismayed by contradiction, Snyder finds no need to reconcile the place he has established for himself within American culture and his place without it. "When I say I reject Western civilization," he explained, "I certainly don't mean I reject the use of the intellect and logic. I mean I don t have any use for the alienating and contradictory culture of the last 300 years, which is destructive and anti-human, in spite of the admirable---abstractly---development of science. A steam engine is, by itself, a beautiful and admirable thing, a real tribute to the human mind. It's the way it gets used and the way people let it use them that goes wrong. The achievement of Western philosophy in logical, clear thinking is one of the most precious things in the world. And Buddhism has much to learn from Western philosophy in this regard. I am a Buddhist because I think Buddhism has the means to lead to personal insight and the capacity for intuitively making moral choices. But for putting moral choices into effective action in the world, one must be capable of clear and analytical thought, of accurate exposition, of using and organizing facts. So, the West isn't so much bad as it is sick, and the lacking in faith in the intuitive mind." And yet Snyder's own intuition, although he doesn't credit it to the West, is certainly a product of the Far West. It is, there, from strange seeds blown by fresh winds, that America's new intuition is growing. "This is largely a big rural movement," he says, sounding rural himself, with an affected country twang, Far Western, hayseed and cracker-barrel, but speaking also with an interlacing of hip colloquialisms and evident erudition that at the same time dispelled any corn from what he had to say. "Like the kids coming into San Francisco and going down to North Beach these days, they're not from the cities mostly, but from the farms or back wood, where they've been working in isolation, hatching, sort of, writing their poetry or reading or just thinking, picking up on all sorts of ideas, and now they're bringing this great rural culture to the urban centers. See, you city fellers don't have any monopoly on culture." Actually, Snyder himself was born in San Francisco. "My parents were extremely poor---the Depression," he said. "So they went back to Seattle, my father's home town, and got a tarpaper shack and an acre of stumpland out north of town. Over the years, my father built the place up, fenced it, got another acre, fixed the house, built a barn and got cows and chickens. I was brought up a farmboy with chickens to feed and a milk route to our neighbors. My mother was, and is, a very high-strung, neurotic person with literary ambitions, and farm life and poverty wore her down. She was, and is, impossible, but she got me onto books and poetry at the age of five. When I was seven, I burned my feet badly while burning brush, and for four months couldn't walk. So my folks brought me piles of books from the Seattle public library and it was then I really learned to read and from that time on was voracious---I figure that accident changed my life. At the end of four months, I had read more than most kids do by the time they're 18. And I didn't stop. I was hung up on American Indians and nature all through childhood and hated civilization for having, fucked up the Indians, as described in Ernest Thompson Seton's Book of the Woodcraft Indians, my bible still, and for ruining the woods and soil---which I could see going on all about me. "So when I say I am anarchist today and don't have much use for Western culture, I guess it goes pretty far back. I spent most of my spare time as a kid in the woods around our place and, feeling at home there, always felt uncomfortable when we went into Seattle. In high school---we had moved to Portland on account of the war---I took to spending my summers in the Cascade Mountains and did a lot of real mountaineering---glaciers and all that---Mount Hood, Baker, Rainier, Shasta, Adams, St. Helens, et cetera, and skied in the winters. Ran around with a gang of ex-ski-troopers; we called ourselves the Wolken-schiebers. My parents---and grandparents---were radicals and atheists, so when I got a chance to go to Reed College on a scholarship, I took it. With scholarships and odd jobs and greatly enjoyed tricks of living on nothing, I made it through college, making it summertimes by trail-crew and logging and labor jobs. And in the summer of 1948, I hitched to New York and worked on a ship to South America. I had to wait until I got the ship and I was broke in New York. For a couple of days, I panhandled for food and slept on park benches, roaming through Greenwich Village. "I was very Marxist in college, but couldn't make it with the regular Commie bunch because of my individualistic-bohemian-anarchist tendencies, all much looked down upon. Of course, being the only real member of the proletariat in the bunch of them, the others being upper middle class New York kids as a rule, they really couldn't say much. I took anthropology---Indians---and literature at Reed and got much involved with primitive religion, mythology and primitive literature---song, ritual, dance---and at about the same time was beginning to read Far Eastern history and Chinese poetry. I was married for about six months then and my left-wing wife didn't dig this sudden interest in Oriental philosophy and Shoshone folk tales. Out of college, I spent the summer of 1951 as a log-scaler on an Indian reservation, where I dug the Berry Feast and later made up the poem about it, and then went on a long hike in the Olympic Mountains. Up in the mountains, all the notions that had been swarming in my head crystallized and sort or hung there until the Fall of that year I picked up a copy of D. T. Suzuki, writing about Zen, and read it while hitchhiking to a graduate fellowship at Indiana in anthropology. It finished the job, and although I stayed one semester at Indiana, I was through with the academic world and headed back West in '52 for what proved to be five years of mountain jobs, scenes in San Francisco, Chinese language study, writing poetry, and so on, until I first came to Japan. Then I was at sea on a tanker for eight months, in San Francisco and back In Japan again. I love to roam around and I like tough self-discipline, I don't mind hard work, and being poor never bothered me. I guess that's what makes it possible to carry on like I do. Being free don't mean evading necessity, it means outsmarting it." Snyder's emergence from the soil of America shows, of course, to what extent the roots of the Beat Generation are buried there. Whether by the romanticism which is another root or the realism which is still another, he has become a symbol of the fellaheen man that Kerouac keeps referring to---the farmers who give hitchhikers lifts in the rattletrap trucks that are the latter-day prairie schooners of the West, the blacks who share their Saturday night wine in the bottle gangs of small-town alleys, the cowboys who spend the week telling about their weekend love rites that are sometimes grossly overstated if not overrated, the Mexicans who always offer a part of the nothing they have, sometimes no more than vermin hospitality, and sometimes marijuana by candlelight. To Kerouac, as to other Beats, the fellaheen man, the man of the soil, the man of the great serf class, is creating his own culture.